We have removed the “tabs” across the top of the page. We have removed all of the form data “destinations” (like email and database) from the menu on the left. These are now all accessible in the “Save/Send Data To” integrations area. We have removed pages from the left menu that are not really needed. I.e. 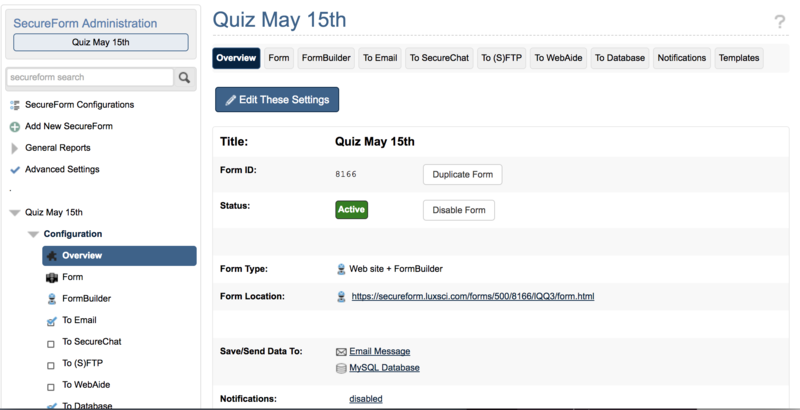 when using FormBuilder, the FormBuilder “Settings” area gives you access to all “web form” controls. So there is no longer a need for the “Web” menu item. Overall, the design is much simpler and more straight forward, while also allowing us to scale out the number of places that we allow you to send/save your data. 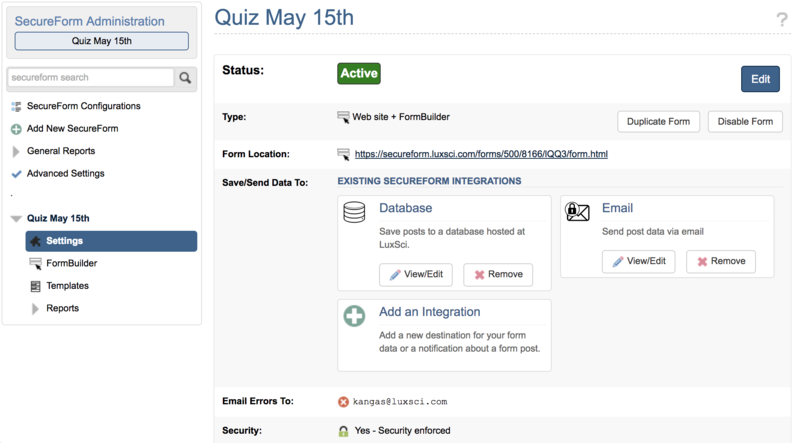 All of the places that SecureForm allows you to save/send your form data are now called “Integrations”. You can choose any combination of Integrations for each of your forms. Click on “Add an Integration” to configure and enable a new integration for your form. The Integrations like Database, Documents, Email, FTP, Notice, and SecureChat have all the same settings that they used to have and remain enabled for your forms as you have them configured. 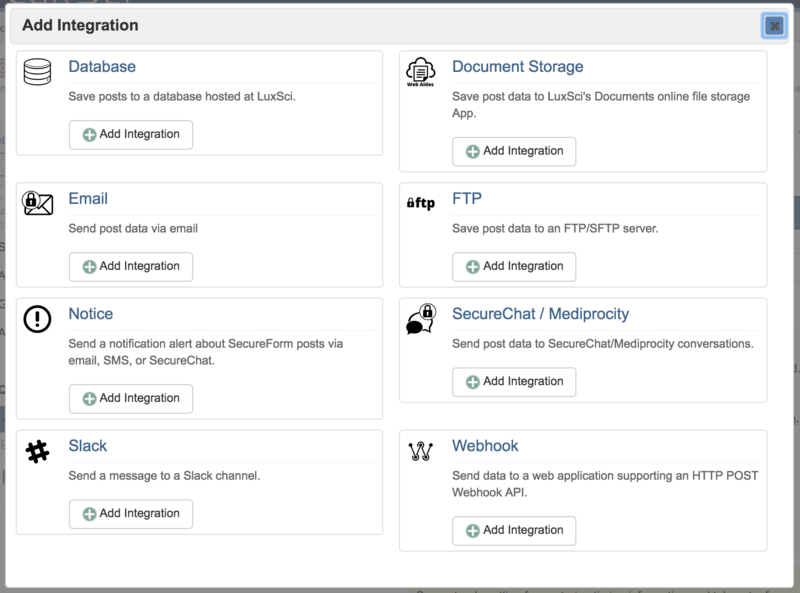 In response to popular demand, LuxSci has added two new Integrations: WebHook and Slack. Gives you web site address to which you should send data (usually, that address is custom-made for you and has account and authentication information built into it). I.e., LuxSci’s Webhook integration is designed to be flexible enough to work with most any third-party provider’s Webhook service … even ones (like SafesForce) which require complex data formats. Slack is an extremely popular platform and we have had many requests from customers who want to send notices or data to Slack channels whenever a SecureForm post comes in. Slack has an Inbound Webhook API. However, we have simplified access to that by providing a Slack-specific SecureForm integration. All you need to do is provide the Slack Webhook URL and the plain text message that you would like sent to that Slack channel. Of course, that text message can be a “template” with place holders where selected data fields will be placed. You can also choose to send all of the posted form data to Slack as a plain text attachment to your message. Nice! While Webhook serves as a generic way to communicate with a large number of third-party services, you can expect LuxSci to add more and more explicit integrations over the coming year. If you have a great suggestion, let us know! This entry was posted on Saturday, January 20th, 2018 at 12:24 pm	and is filed under New Feature Announcements. You can skip to the end and leave a response. Pinging is currently not allowed.